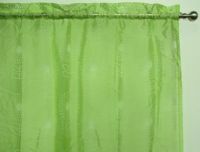 These curtains are unlined but not sheer like lace and not blockout. Perfect for use over blinds when you'd like to add some colour and style to a room. Will also add privacy in areas that blinds don't cover. Available in 5 colours. Available in latte, magenta, snow, thunder and aqua.